The stadium will feature 10,000 seats for Wildcat Fans. Concession stands: on both sides of the stadium. Each side will feature a retail space for areas like Alumni Affairs to sell merchandise such as t-shirts or programs. Additionally, the stadium will have vendor booths available throughout its breezeway. Press Boxes: for the media to cover play-by-play action on the gridiron. A President’s Box: A special guest site that will hold approximately 30 people. 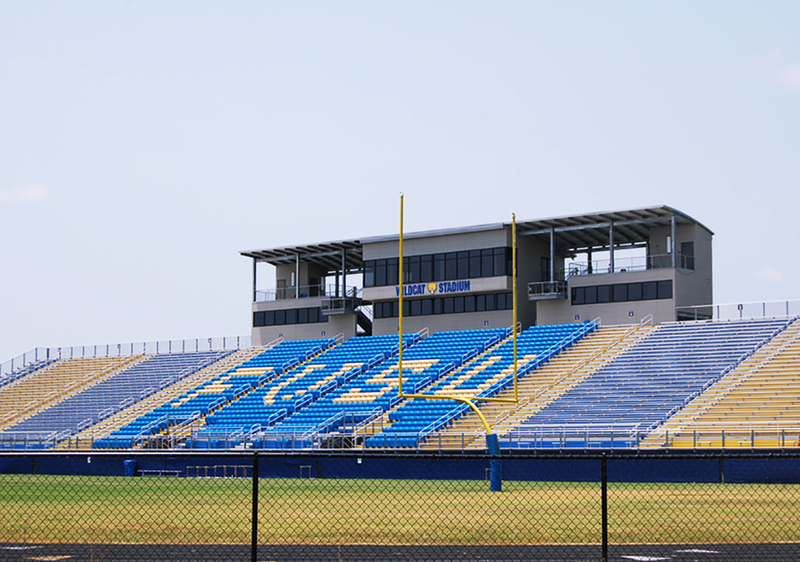 Observation decks on either side of the box will allow visitors a wide-angle view of the field. Coaches’ Boxes: To help head coaches strategize and adjust their game plan by giving them a bird’s eye view of the action as it happens. Three Skyboxes: offer luxury for group parties of 10 to 15 people. Sodexofeatures an online catering menu for skybox parties. Brand-new Score Board: with video playback monitors. Advertising panels on both sides. Athletic opportunities include intramural sports and intercollegiate men's basketball, cross country, football, tennis, and track and field, and women's basketball, cross country, softball, tennis, volleyball, and track and field. The school currently competes as a member of the Southern Intercollegiate Athletic Conference. In 1952, Fort Valley alumna Catherine Hardy won a gold medal as a member of the winning 400-meter women’s relay team at the Olympic Games at Helsinki, Finland. In 1969, the Fort Valley State football team set the modern-era record for most points scored against a college opponent, with 106 points against Knoxville College. In 1995 Tyrone Poole became the first football player from Fort Valley State University to be selected in the first round of the NFL Draft. In 2006 alumnus Rayfield Wright was selected to the NFL Hall of Fame. 11 Wildcats have played in the NFL.